For individuals with dreams of being the next big fashion designer, the University of Indiana Bloomington offers a bachelor's degree in fashion design. Just 53 miles from Indianapolis, IN, the school serves more than 110,000 students. 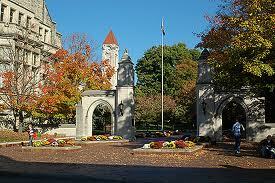 Originally a seminary, Indiana University Bloomington officially became a postsecondary institution in 1828. As of 2011, it served approximately 110,436 students through 14 colleges and schools. The Higher Learning Commission accredits the school to award degrees at all levels, and 9,740 were conferred in 2009-2010. U.S. News and World Report ranked Indiana University Bloomington 75th among all national universities for 2012. The College of Arts and Sciences' Department of Apparel Merchandising and Interior Design offers a bachelor's degree in fashion design as of 2011. It also houses a collection of fashion apparel and accessories totaling more than 20,000 pieces from as early as 1937. Faculty encourages fashion students to enter fashion competitions held each spring by a variety of organizations, including Fashion Group International, Costume Society of America and International Textile and Apparel Association. This 2-year certificate program totals 27 credit hours. Required courses cover fashion research and illustration, textile science and three studio sessions about garment fitting and construction. Students must also plan and present a fashion line. They must choose one course from experimental studio options in shape and foundation, tailoring, digital applications or draping. Credits from this program can transfer toward the school's Apparel Merchandising Bachelor of Science. Majors complete a minimum of 37 credit hours. In their second of four years, students learn pattern development and clothing construction through fashion studio courses. They study the properties of various fabrics and fashion themes. Other courses address sketching, the history of fashion, tailoring, accessories and collection management. Instructors encourage students to participate in internships either off campus or with the university's music and theater programs.